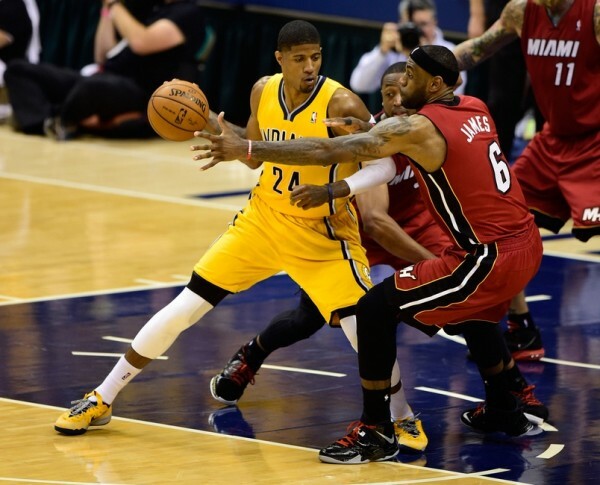 We don’t usually see a huge focus on concussions in the NBA, but Paul George getting hit on the head by Dwyane Wade’s knee seems to be the main thing the Indiana Pacers are worried about right now, hoping their star player is able to pass all the tests heading into game 3 of the series with the Miami Heat in the Eastern Conference Finals. Right now? George is doing some light practice, which means shooting, making a dunk or two but not having any contact with anyone. There’s a strict protocol about the stages of coming back from a concussion that the medical crew missed during the game, but later had to change their treatment and approach to the matter because George told reported he blacked out for a moment after getting hit on the head with Wade’s knee. How big is the difference between George on the floor and on the bench or in a suit? Frank Vogel said the usual thing: He has guys who can fill in for Paul, but none of them are obviously at his level. He is averaging 21.5 points in 41.5 minutes a night during the postseason, as the Pacers don’t have too much faith in what their bench is giving them. With George on the floor, their net rating is a +6.5. Without him, their offensive rating falls from 102.6 to 88.8, their defensive rating is also worse (from 96.5 to 107) and their net rating is a -18.1. George didn’t talk to reporters after practice, as the Pacers are trying to keep any information about his involvement in the next game on the down low. If he actually has to stay off the floor for more minutes in next game or not play entirely, it’ll probably mean we’ll see Chris Copeland or Evan Turner starting for him – both players whose uses remain entirely on the offensive side of the ball, although many have been calling the Pacers, struggling to get anything from lineups involving their bench players so far in the playoffs, to use Copeland more. Turner, a huge disappointment following the trade with the Sixers that eventually landed Danny Granger with the Clippers, is averaging 3.5 points on 13.3 minutes a night during the playoffs. He still hasn’t played in the series against the Heat. Copeland is averaging only 6.2 minutes in the postseason, playing a total of 11 minutes over the last four games, taking part in only two of them. The Pacers, even if they have tried hard to improve their bench during the offseason and the season itself, don’t seem to have any faith in the players behind their starters, or have simply done an awful job of bringing them into the fray. 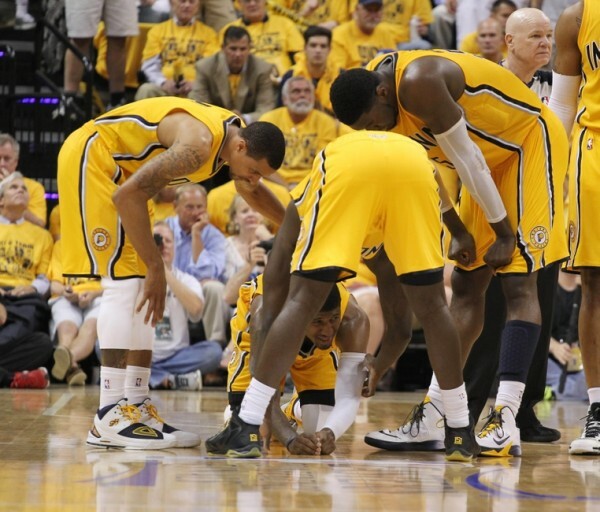 It is probably too soon to try and think about the lineups the Pacers will use if and when George isn’t able to play. The likeliest of scenarios is that George will be through the concussions symptoms and be ready to play against Miami in game 3. Thinking about replacements and subs or different types of lineup is a bit too soon, but there’s no doubt it would be a huge blow for the Pacers to lose George, even if it is just for one night.